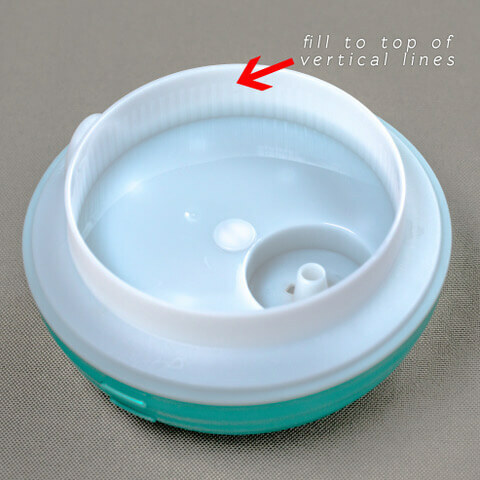 Are Your Essential Oil Diffusers Made With Hospital Grade Plastic? No, our essential oil diffusers are made with medical grade plastics. Can I Use Citrus Oils With SpaRoom Essential Oil Diffusers? Yes, we use polypropylene plastic which is safe to use with any essential oil, including citrus. However, if using citrus oil, make sure to clean out your diffuser after each use. Also, use caution with heavy bodied oils as they may sink to the bottom of the water chamber and clog the diffusing disk. Do I Add Water or Essential Oil First to my Diffuser? All SpaRoom Essential Oil Diffusers are designed to first be filled with water first and then Essential Oil. As we know, water and oil do not mix. But, since the "mist" is created through ultrasonic vibrations, the water is broken down into micro-particles which allows the Essential Oil to attach to it and be transmitted into the air. Adding oil before water can cause the oil to stay in the bottom of the water tank and hinder the ceramic discs performance of creating ultrasonic vibrations that are responsible for producing mist. Do I Need To Clean My Essential Oil Diffuser? To extend the life of your ultrasonic diffuser, please be certain to use only 100% Pure Essential Oils. By doing so, it will ensure your unit qualifies for any future Warranty Claims. Any use of Fragrance Oils will void our warranty due to the synthetic ingredients used. We included the information below, to help with the maintenance of your diffuser. We recommend cleaning your ultrasonic diffuser frequently, especially when you change the selection of your oils. Regular cleaning is important to maintaining the life of your unit. To avoid buildup, please do not let water or oil sit inside the unit when not in use. Over time, mineral deposits and/or oil residue can build up on the vibrating disk, requiring the unit to be cleaned with Klenzor™. KLENZOR™ is our dissolving cleaning tablet, suitable for all ultrasonic differs, which is EPA approved and bio-degradable. To clean, place one dissolving Klenzor™ tablet into the water well of your ultrasonic diffuser. Turn the diffuser on and run for a 2-hour cycle, allowing the tablet to dissolve and eliminate any buildup that may impair its performance or fragrance output. After the cleaning, pour out the contents, being certain to avoid water getting into the air vent opening at the top of the water well. Once emptied, use a cotton swab to gently wipe away any loose buildup from the vibrating disk. Regular use of Klenzor™ can extend the life of your unit. We suggest following our recommended cleaning frequency listed below. How Do I Use My Diffuser? We sell many diffusers and they all have different functions. Please refer to your instruction manual for specific directions on how to use yours properly. How Much Water Do I Add To My Essential Oil Diffuser? SpaRoom Ultrasonic diffusers are most effective, last the longest and output the most mist when filled properly. 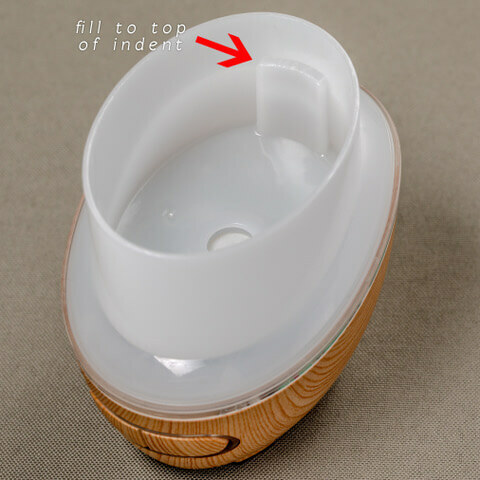 Every diffuser is different and detailed instructions are included in each package, but as a guideline, we currently have five (5) different ways of indicating the Max Fill Line on our diffusers. NEVER overfill a diffuser with water by exceeding its Max Fill Line. I Lost My Instruction Manual. Where Can I Get Another? If you no longer have your instruction manual, you can find it listed on our Instruction Manuals page. What Type of Oil Can I Use In My Essential Oil Diffuser? Almost all of our SpaRoom Essential Oils are 100% Pure, with the exception of a few of our blends. Other companies offer cheap, misleading Oils that may be 100% Natural, but consist of mostly Carrier Oils. Carrier Oils are meant to be applied topically, not diffused. 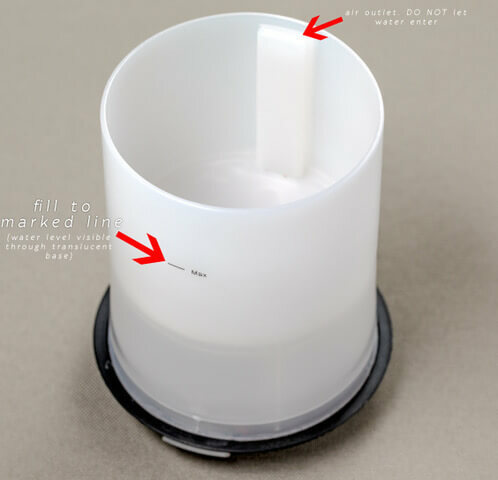 Their thick consistency can actually ruin your diffuser—not just SpaRoom products, but other diffusers too. Most importantly, do not ever use Fragrance Oils in our diffusers. Find out more about different types of Oils here. Once you have decided on an Essential Oil to diffuse, refer to your SpaRoom Instruction Manual to see how many drops are recommended for your unit. Adding too much or too little oil can impact mist output! What Type of Water Do I Put In My Essential Oil Diffuser? For all of our SpaRoom Essential Oil Diffusers, we recommend using tap or bottled water. Water temperature can have an effect on mist output, too! Warmer water tends to create a fuller mist while cold water can inhibit ultrasonic vibrations, therefore producing less mist. 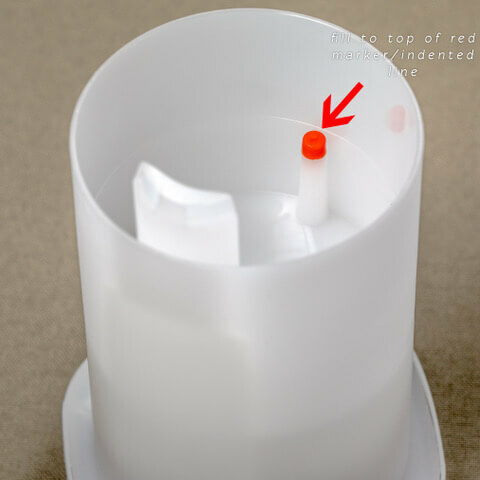 When And How Do I Clean My Essential Oil Diffuser? We recommend cleaning your diffuser frequently, especially when you change your selection of essential oils. Regular cleaning is important to maintain the life of your unit. To avoid buildup, please do not let water or oil inside the unit when not in use. 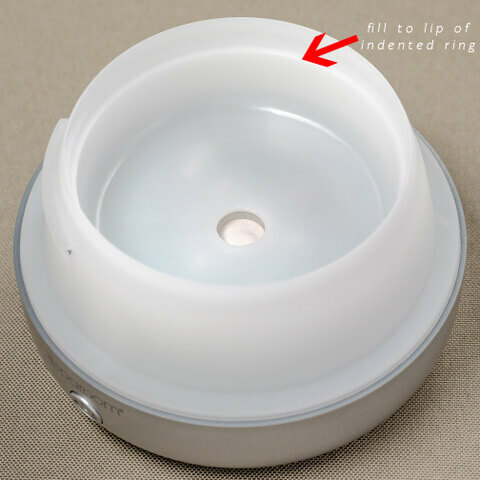 Over time, water, mineral or oil buildup on the vibrating disk can decrease the effectiveness of your ultrasonic diffuser. We only recommend Klenzor, our diffuser cleansing tablets, which quickly and easily free your diffuser of any buildup and mineral deposits. If you do not have any Klenzor on hand, a good way to remove possible buildup is to mix ¼ cup of white vinegar with warm water. Let it soak inside the water well for 3 hours. Do not turn the unit on while soaking. After 3 hours, dump out the water and use a cotton swab to gently wipe away any loose buildup from the vibrating disk. Do not push hard on the disk. Rinse the unit out and fill with clean cool water. Plug the unit back in and begin misting. What Do I Do If I Believe I Have A Defective Adapter? If you believe you have a defective adapter, contact our Customer Care department by phone at 833-729-4859. You will need your mailing address & credit card information to process your order. Does My Absorbing Pad Need To Be Replaced? How Often? Some storage tips would be to keep the pad in an air tight container or baggie when not in use. You'll notice the pad becoming very saturated and no longer able to hold oil, that will be an indication to change the pad. You should be able to purchase replacement pads at the location where you purchased your diffuser or on our Accessories Page. At SpaRoom® we are committed to customer satisfaction. Should you ever have any issues or questions, our Customer Care Team is available Monday thru Friday from 9:00AM to 5:00PM EST to assist you with any of your needs. Our Customer Care Team can be reached via phone at 833-729-4859 or by email here. Our Customer Care Team is dedicated to responding to all customer requests within 24 hours during our business week. Response time will vary on weekends. If the diffuser is not misting very strongly, there are a few things that can cause this. Check your water level. If the water is too full, the mist will not come out strongly. We recommend filling the water slightly below the max fill line. Make sure the unit is sitting on a hard, flat surface. Do not place it on something soft, like a towel that could absorb the ultrasonic vibrations. Make sure the unit is not sitting directly under an air vent or fan that may be dispersing the mist. Make sure it is properly plugged in. If it’s plugged in, and the lights nor mist will turn on, make sure there is power coming from your source. A possible cause may be mineral or oil buildup, causing the unit to have difficulty misting. Please proceed with cleaning your diffuser with Klenzor™. Depending on the motor or fan strength of your diffuser, some noise is normal during operation. It is also common to hear the water moving inside your unit. If the unit is making a noise that sounds abnormal, please discontinue use and call our Customer Care Team. at 833-729-4859 or email here.